These Cupcakes are So Decadent: Dark Chocolate--Peanut Butter Cream--Oreos--Cupcakes--all that's missing is the glass of milk! 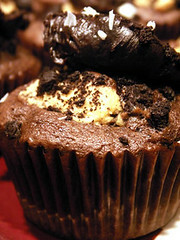 Clearly, I'm too hungry for proper cupcake blogging, these are all making my stomach rumble. Allison, will you make me these for my birthday? Actually, these may even inspire ME to bust out my baking paraphernalia and make some cupcake yumminess. hmmm....those look so good!!! i wanna go home and make some right now!